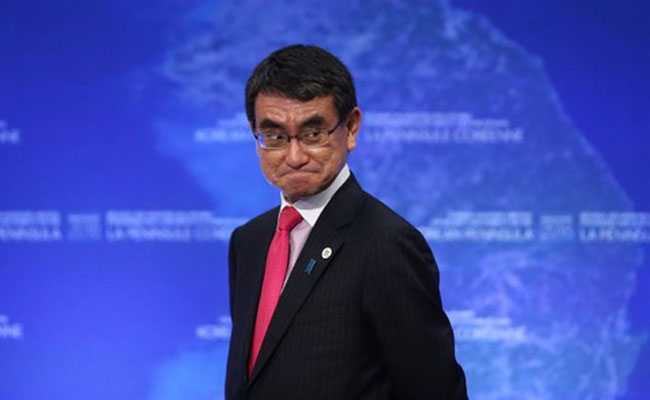 Japanese Foreign Minister Taro Kono said that there are about 1,400 Japanese companies with over 4,800 establishments in India. Taro Kono said there are about 1,400 Japanese companies with over 4,800 establishments in India. Tokyo: Japanese Foreign Minister Taro Kono has hailed the remarkable progress of Indo-Japan strategic ties in 2017, describing it as a "great year" for bilateral relations. Kono was speaking at the Republic Day celebration event hosted by India's Ambassador to Japan Sujan R Chinoy at the Indian Embassy yesterday. "I would like to express my heartfelt congratulations on the occasion of India's Republic Day and to express my appreciation to our host Ambassador Chinoy and Mrs Chinoy. Thank you for bringing us together today to celebrate this important event for your country," he said in his speech. "I feel like I need to speak in Hindi as Ambassador spoke in such good Japanese. My apology for not being able to do that. "Japan and India are strategic partners that share values such as democracy, human rights and rule of law. I was witness to our close relationship last year when I visited India at the gracious invitation of the Indian government. I was struck by our remarkable relationship of friendship and respect," the foreign minister said. "India is one of the most important partners in promoting our Free and Open Indo-Pacific Strategy. In 2017, we saw many positive developments in our bilateral relationship," Kono said as he recalled Japanese Premier Shinzo Abe's visit to Prime Minister Narendra Modi's home state of Gujarat where the two leaders held their 10th summit meeting. He noted that economic relations were robust as there are about 1,400 Japanese companies with over 4,800 establishments in India. Numbers that continue to grow every year. Last year was also the year of Japan-India Friendly Exchanges with around 200 cultural events being held in India and Japan. "2017 was undoubtedly a great year for Japan-India relations. I will strive to make sure 2018 is an even greater one. I hope to have a chance to visit India this year. In closing, I would like to express my heartfelt wishes for the further prosperity of the people of India and the continued development of Japan India partnership," Kono said.